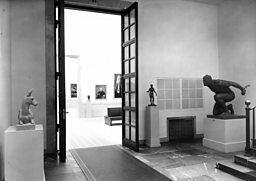 In 1937, two competing exhibitions caused a dramatic split in the art world. In one, traditional German art held sway. The other featured the ‘degenerate’ modern art hated by Hitler. Eighty years later, WILLIAM COOK considers one of the most important clashes in 20th Century art. Eighty years ago, here in Munich, Adolf Hitler staged two exhibitions which defined the way we think about modern art. The Great German Art show displayed the artists he approved of, the Degenerate Art show displayed the artists he despised. In these two exhibitions, mounted side by side in adjacent galleries, the battle lines were drawn between traditionalism and modernism. It’s a battle that’s still being fought today. Do you like art that’s realistic and reassuring? Or do you prefer art that’s experimental or disturbing? Maybe you like a bit of both - in which case, you’re like a lot of people who went to see these shows. The Nazis wanted people to see both shows, but they didn’t want people to make up their own minds. The idea was to see the Degenerate Art show, and see how German art had been debased - and then see the Great German Art show, and see how the Nazis has redeemed it. Half a million people saw the Great German Art show (more than half the population of prewar Munich) but two million flocked to see the exhibition of ‘degenerate’ art. This wasn’t what Hitler had intended. Clearly, something had gone badly wrong. How many came to mock these ‘degenerate’ artworks, and how many came to admire them? It’s impossible to tell (in Hitler’s Germany, dissenters ended up in concentration camps) but, either way, ‘degenerate’ art had proved too popular. The Great German Art show was restaged every year, right up until 1945. The Degenerate Art show was never repeated. The Nazis destroyed a thousand of these modernist masterpieces. The remainder were sold to off foreign buyers at an auction in Lucerne. So what was ‘degenerate’ art, and why did Hitler hate it? And what sort of art was in the Great German Art show? Contrary to popular misconception, only a small number of artworks in the Great German Art show were overtly Fascistic. Most were merely conventional depictions of conventional subjects: bucolic landscapes, wholesome nudes... ‘Degenerate’ art was anything which challenged this idyllic world view, from the bold colours of Der Blaue Reiter to the stark portraits of Die Brücke (‘the hallucinations of lunatics and criminals,’ as Hitler called them in Mein Kampf). Such a direct stand-off between two rival schools was a fascinating concept - but as propaganda it backfired. The Great German Art show was displayed in palatial splendour in the Haus der Deutschen Kunst (House of German Art), a grandiose new gallery built by Hitler’s favourite architect, Paul Troost, to the Fuhrer’s own design. The Degenerate Art Show was crammed into the Archaeological Institute - a smaller, plainer building across the road. Even so, there was no hiding which was the better show. The anodyne artists in the Great German Art show seemed mediocre by comparison. Even Hitler was disappointed by this banal display. Munich was heavily bombed in the Second World War and rebuilt in a hurry, but, against all odds, the galleries that housed these two shows both survived. The Haus der Deutschen Kunst (since renamed the Haus der Kunst) is now a modern art gallery, devoted to the sort of artworks that Hitler abhorred. The former Archaeological Institute is now home to the Munich Kunstverein. In Hitler’s day, this artists’ guild was a conservative institution. Nowadays, it’s a bastion of the avant-garde. Defeated in 1937, modernism now reigns supreme. Degenerate Art lost the battle, but it won the war. So why does this story still matter, after all these years? Because the issues it raises have never gone away. All around the world, reactionary regimes are still trying to suppress subversive artists, and make art subservient to the state. In 1945, there were only a handful of modernist paintings left in Munich, but over the last 70 years its museums have worked tirelessly to bring back the treasures that were dispersed by the Third Reich. Today Munich is a centre of modern art once more: the historic Lenbachhaus (recently redesigned by Sir Norman Foster) houses a splendid array of German Expressionists like Franz Marc and August Macke; the futuristic Pinakothek der Moderne contains key works by many of the ‘degenerate’ artists of 1937. The gallery that sums up this renaissance is Hitler’s Haus der (Deutschen) Kunst, the first public building he commissioned when he became Chancellor. The ceremonial hammer broke, which Hitler regarded as a bad omen. He was right. His prediction came to pass, but not in the way that he intended. Today, this austere structure is a forum for modern art from all around the world, including (genuine) German artists like Joseph Beuys and Gerhard Richter. Hitler would have loathed it. And, in the end, that’s probably the best riposte of all. Adolf Hitler and senior Nazis Hermann Goering and Joseph Goebbels visit the 'House for German Art', Munich, 18 July 1937. Heinrich Hoffmann/AFP/Getty Images. 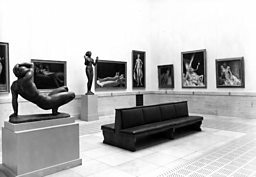 Installation view of the Great German Art Exhibition in the House of German Art in 1938. The exhibition was meant to showcase the aesthetic virtues of a purer, more traditional German art. Great German Art Exhibition, House of German Art, 1939. The traditional, classical forms of the ancient Greeks and Romans were praised by the Nazis .Photo Jaeger and Goergen © Central Institute for Art History, Photothek. Haus der Kunst. Photo: Jens Weber, München, 2007. 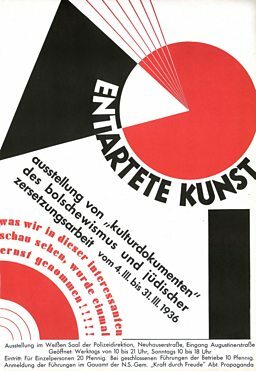 Poster for 'Entartete Kunst' ('Degenerate Art'), 1937. Photo by Stary/ullstein bild via Getty Images. 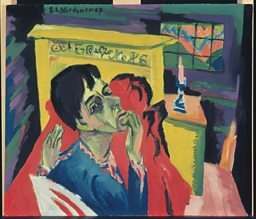 Self-portrait as an Invalid, 1918, Ernst Ludwig Kirchner. A key founder of the 'degenerate' Die Brücke art movement, Kirchner took his own life in 1938. © Bayerische Staatsgemäldesammlungen, Sammlung Moderne Kunst at the Pinakothek der Moderne, Munich. 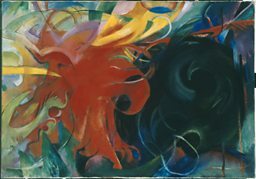 Fighting forms, 1914, Franz Marc. 'Degenerate' artist Marc was an important German Expressionist painter. © Bayerische Staatsgemäldesammlungen, Sammlung Moderne Kunst at the Pinakothek der Moderne, Munich. 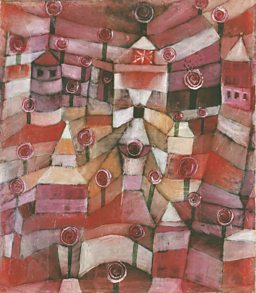 Rose Garden, Paul Klee, 1920. 17 artworks by Klee were included in the 'degenerate' art exhibition. Photo by Fine Art Images/Heritage Images/Getty Images. 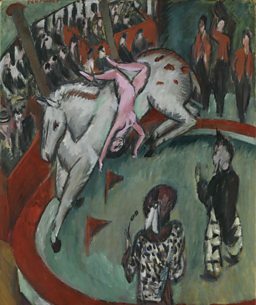 Circus, 1913, Ernst Ludwig Kirchner © Bayerische Staatsgemäldesammlungen, Sammlung Moderne Kunst at the Pinakothek der Moderne, Munich. Little Walter's Toys, 1912, August Macke. 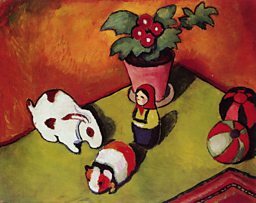 An important member of the Expressionist group, Der Blaue Reiter, Macke found his works criticised by the the Nazi authorities. Photo by Fine Art Images/Heritage Images/Getty Images. Entartete Kunst. 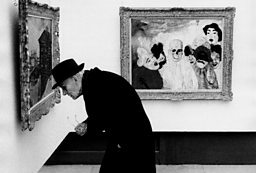 (Degenerate art) in the Haus der Kunst: visitor in front of James Ensor's 'The Death and the Masks'. Photo by Rudolf Dietrich/ullstein bild via Getty Images.